The popularity of indoor gardens has taken the gardening community by storm. With that said, most people are looking into which is the best grow tent that they can use to start their own indoor garden. Many wanted to create an environment where they can manage the conditions of the plants they care for. Grow tents give them the freedom of doing so and also allows them to accurately monitor the progress. There are many factors to consider when choosing the best grow tent. Another thing is that there are numerous grow tents on the market today, spotting the best is a challenge. You need to equip yourself with that vital knowledge before you finally put your money into it. This guide will help you unearth the top grow tents and you will also see tips on what to look for when picking out the one that will suit your needs. 32" x 32" x 63"
The VIVOSUN Mylar Hydroponic Grow Tent features metal poles for its frame for additional stability. It also has a smooth finish to ensure easy installation. It stands at 60 inches in height, has 48 inches in length, and 24 inches in width. 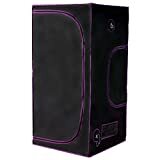 The VIVOSUN Mylar Hydroponic Grow Tent is made from top-quality 600D canvas that is proven to be durable. Its tent is tearproof and is double stitched to help block light from the outside effectively. The inside of the VIVOSUN Mylar Hydroponic Grow Tent is lined with reflective Mylar. It also has an observation window and a floor tray as an additional feature. It is equipped with heavy-duty metal zippers to ensure that the tent is fully enclosed. The next product we have is the Best Choice Products Reflective Mylar Hydroponics Grow Tent. This stands at a height of 63 inches, has a length of 32 inches, and width of 32 inches. It is made of a 600D polyester, nylon, and plastic lined material. The remarkable thing about the Best Choice Products Reflective Mylar Hydroponics Grow Tent is that it has a very favorable reflective ratio which is at 100%. Additionally, the material used for the Best Choice Products Reflective Mylar Hydroponics Grow Tent is non-toxic and waterproof. 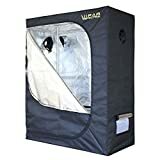 This grow tent is also equipped with multiple vents and its walls have high insulation properties which are perfect for the healthy growth of your plants. It also features a removable floor tray that is made of waterproof PVC plastic. With the height of 80 inches, length of 60 inches and width of 60 inches, the IPOMELO Mylar Hydroponic Grow Tent is the third item on the list. 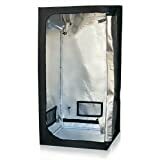 This grow tent features an exterior made from heavy-duty 600D oxford cloth which is durable and weather resistant. On the other hand, its interior is lined with a non-toxic, waterproof, and highly reflective Mylar. Furthermore, the IPOMELO Mylar Hydroponic Grow Tent is equipped with a steel edge with a 19mm powder-coated steel hanger. This ensures durability, sturdiness, and stability of the product. It also features heavy-duty zippers, an observation window, and a removable, waterproof floor tray. Like the IPOMELO Mylar Hydroponic Grow Tent, the VIPARSPECTRA 600D Reflective Mylar Hydroponic Grow Tent also has a weather-resistant, heavy-duty 600D oxford cloth for its tent exterior. This interior is also lined with a non-toxic, 100% reflective and waterproof Mylar. This makes it an extremely durable tent. 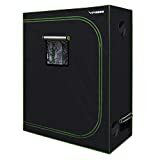 The VIPARSPECTRA 600D Reflective Mylar Hydroponic Grow Tent also has powder-coated, heavy-duty steel frame with metal connectors. Additionally, it is also equipped with heavy-duty zippers and double-stitching on its fabric. It also features multiple vents for adequate air circulation with a pre-filter to ensure bugs can’t get to your plants. To conclude, it has a removable and waterproof floor tray as well. The last item on the list is the Apollo Horticulture Mylar Hydroponic Grow Tent. This product stands at a height of 72 inches, has a length of 36 inches and a width of 36 inches. This grow tent is made of a thick material and is secured with double stitching to also ensure that excess light will not leak inside. Additionally, the interior is lined with a 1005 light proof tear proof and highly reflective Mylar film. This allows the tent to create the ideal temperature inside of it for growing plants. It is also equipped with heavy-duty, metal zippers. The Apollo Horticulture Mylar Hydroponic Grow Tent also features a removable floor tray. If you are trying to find the best grow tent, you have to look into some important factors. This will help you to have a more thorough understanding which product is the best to suit your needs. The size of your grow tent will highly be dependent on the vacant space you have in your home. To determine what size you will get for your grow tent, you must survey and assess the size of the available space you have in your home. Grow tents can have small size options like 2 x 2 or 3 x 3 in general. For those who have more considerable available space, you can go for the larger grow tents offered in the market. Durability is one of the most significant factors that you must look into when choosing the best grow tent. This will determine how long your grow tent will last and if it can perform well under any circumstances. Opt for grow tent that has steel metal frames and connectors. Zippers that are heavy-duty and of good quality is also a plus. Lastly, go for grow tents that are made from high-quality material. One of the chief purposes of a grow tent is for you to have control over the environment of your plants. This means you get to set how much light should be received by your plants. This is why light proofing is another critical factor. The light inside the grow tent must be contained and no additional amount of light should be seeping in from outside. Too much light could cause unfortunate results for your garden. Make sure to pick out a grow tent that has remarkable light proofing features. Another thing you have to have control over is water. Like how much amount of light, the amount of water received by your plants should also be just enough. Too little or too much can both be harmful to the plants. Waterproof grow tents works best to make sure no excess water will go into the plants that can drown them. Your grow tent must also have adequate air circulation. This will help regulate the temperature inside. The ideal grow tent must have outstanding ventilation to provide ample amount of air circulating inside the tent. 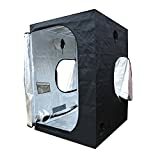 There are also additional features that an ideal grow tent must have like reflective inner walls, an observation window, and made of non-toxic material. These features are as important to have in a grow tent to make sure that your plants will grow healthy. The reflective inner walls will maximize the amount of light emitted by bulbs inside the tent. The observation window will be an excellent tool for keeping a attentive eye on your growing plants. Finally, it is noteworthy that the tent is made of non-toxic materials to make sure no harm will come to your plants and yourself as well. Ultimately, out of the excellent items we have on the list, there is one that stands out. Taking into account all the critical factors when choosing a grow tent, the best grow tent that I recommend is the IPOMELO Mylar Hydroponic Grow Tent. Its durability is proven through the exterior material its made of which is a heavy-duty 600D oxford cloth that is also weather resistant. Furthermore, its interior is lined with waterproof Mylar that is also non-toxic and highly reflective. The frame of the IPOMELO Mylar Hydroponic Grow Tent is a powder-coated, heavy-duty steel. Partnered with metal connectors and high-quality zippers, this product can last a long time. The best thing about it is that it is equipped with multiple vents, but at the same time has pre-filters to keep those bugs away. Did you like this post? Did you have any other questions in mind? Did you find this article helpful in choosing the best grow tent in the market? If you have anything to add or share, please feel free to sound them off in the comment section below.